The Floor Clicker Prize Wheel is a crowd pleaser! Standing 74" high and 31" wide, the Floor Clicker Prize Wheel draws a crowd at the office, a tradeshow, a store, an annual meeting, an on-location radio broadcast, a wedding or any other event! Fun and easy way to draw crowds at fundraisers, tradeshows and educational events. Weighing only 6 pounds, the Mini Wheel is compact, easy to transport and small enough to fit on a desk or tabletop. The clicking sound builds excitement as it spins! 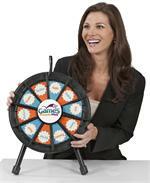 The Prize Wheel Travel Case is a useful tool for anyone on the go or to ship the Prize Wheel to tradeshows. Recessed foam inserts protect the wheel in transit and storage. 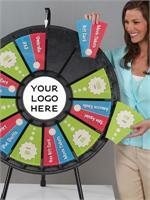 The Prize Wheel Travel Case is a useful tool for anyone on the go or to ship the Mini Prize Wheel to tradeshows. Recessed foam inserts protect the wheel in transit and storage. Fun and easy way to draw crowds at fundraisers, tradeshows and educational events. The Micro Wheel is our smallest, most affordable wheel & is small enough to fit anywhere! The clicking sound builds excitement as it spins! 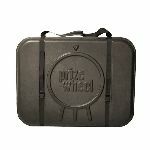 Soft case for our Micro Prize Wheel. The 12-24 Slot Prize Wheel lets you offer from 12-24 prizes! 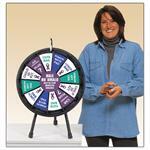 This is table model Clicker Prize Wheel gives you more flexibility. Set it up at the office, tradeshow, meetings, education seminars.. anywhere and watch everyone get excited! The Mini Plinko Travel Case is a useful tool for anyone on the go or to ship the Plinko to tradeshows. Recessed foam inserts protect the wheel in transit and storage. The Mini Plinko is still 3 feet tall! Attract a crowd at your next event with a Plinko game. What is Plinko? It's an easy game where contestants drop a puck into one of the slots and it bounces its way down the board to land on a prize. Simple! The full size Plinko is over 50" tall! Attract a crowd at your next event with a Plinko game. What is Plinko? It's an easy game where contestants drop a puck into one of the slots and it bounces its way down the board to land on a prize. Simple! The Dynamic Donation stand makes fundraising fun and exciting. Donations will increase substantially by strategically locating Dynamic Donation Stands throughout any facility. 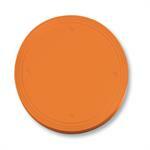 Sold in sets of 3 extra plinko pucks. 2 Sizes. Available in Orange.